What can small groups do? The Frontiers conference was modeled on No Better Time, a meeting held in 2009 at University of New Hampshire. The atmosphere then was optimistic, to say the least. Even the participants who had not voted for Barack Obama were encouraged by the outpouring of civic activism in 2008 and the expansion of relevant federal programs such as AmeriCorps. We talked then about how we would flourish as soon as the recession ended. Now is not “no better time.” During our conference itself, the headlines screamed that a murderous racist had hunted and killed more than 90 children in one of the world’s safest and strongest democracies; the Speaker of the House walked out on the President of the United States during negotiations to save the full faith and credit of the Republic while the economy continues to sag; and the whole country baked in heat that seemed to portend the climate we will leave to our children. We conference organizers had hoped to engender optimism, hope, and confidence in our field. I am not sure we succeeded, or if that goal was possible. He goes on to point out that many of us have a clear bias towards deliberative forms of participation, but that we are increasingly discovering evidence for a role for citizens in governance. Elinor Ostrom’s work (for which she won a Nobel Prize) is one example of this, and indeed during the two-week institute we frequently returned to the role her research could play. I’m struck in particular by an essay she wrote for Scandanvian Political Studies, “Crowding Out Citizenship.” She argues that current public policy is based on a theory of collective inaction, which assumes that most citizens are rational actors unable to sacrifice their individual self-interest in pursuit of the public good. Moreover, collective inaction theories assume that citizens lack sufficient knowledge to design appropriate institutions on their own, so this work must be left up to experts. External interventions crowd out intrinsic motivation if the individuals affected perceive them to be controlling. In that case, both self-determination and self-esteem suffer, and the individuals react by reducing their intrinsic motivation in the activity controlled. Collective inaction theories are at odds with contemporary empirical social science. Pro-social and cooperative attitudes are rampant, while “rule-following punishers” internalize norms and police compliance from others with their own resources. Local communities around the world manage common pool resources using polycentric systems of semiautonomous governance rather than centralized planning and control. The study of civic agency aims to reverse the “crowding out” effect. Instead, local self-managed communities arrange to “crowd in” pro-social attitudes and expertise. Our knowledge and power as citizens is weakest when external interventions render us irrelevant. Unsurprisingly, the opposite is also true: when we are forced to manage our affairs together, we develop the wisdom and the strength to do so. Paying attention to the effects of small-group politics seems naive, since big, impersonal social forces probably have more impact on outcomes. Academic “realism” marginalizes human agency. But small-group politics is morally important–it’s what we should do. 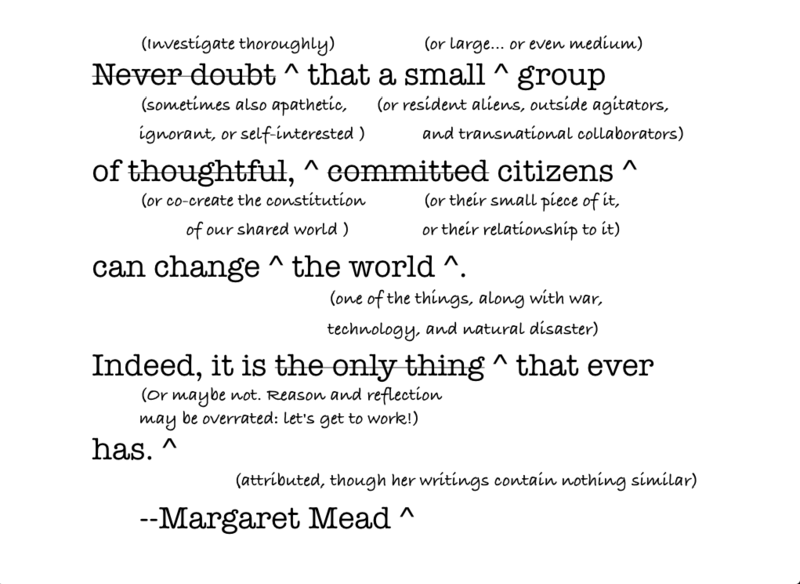 It’s also more significant than the “realists” believe, although less powerful than Margaret Mead implied.